The holidays are in full swing and I may have already gained a few pounds from all of the eggnog and cookies. The cookies I was not supposed to eat, but rather gift. Oops. To take a break from all of the sweets, I decided that for this weeks FN Dish post, that I would go back to my German roots (okay, I'm not German) and make Kartoffelpuffer! Say it with me now... Kartoffelpuffer! Such a fun word, huh? 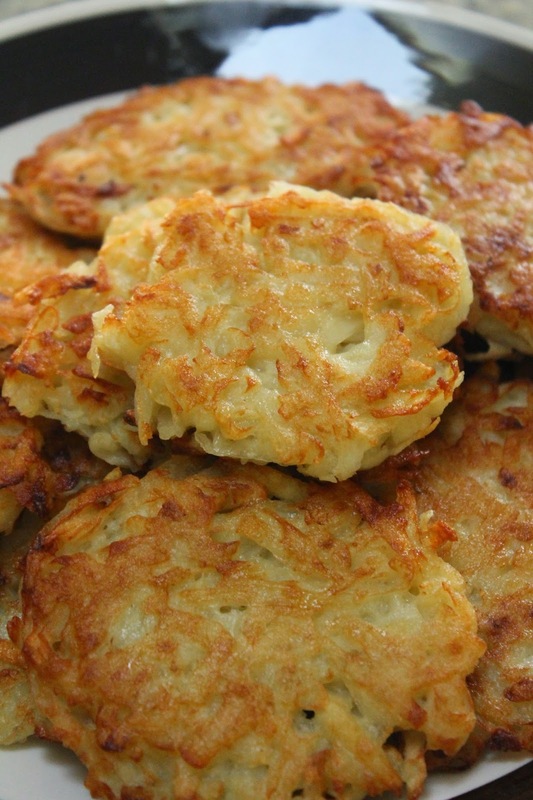 Kartoffelpuffer (also known as Reibekuchen and Kartoffelpfannkuchen - more fun words) are potato pancakes. Although I may not be German and I will not pretend to be a German food connoisseur, I did have a student from Germany live with me for a year. He would always try his hand in our kitchen, and although he was not a very good cook, his potato pancakes were great! 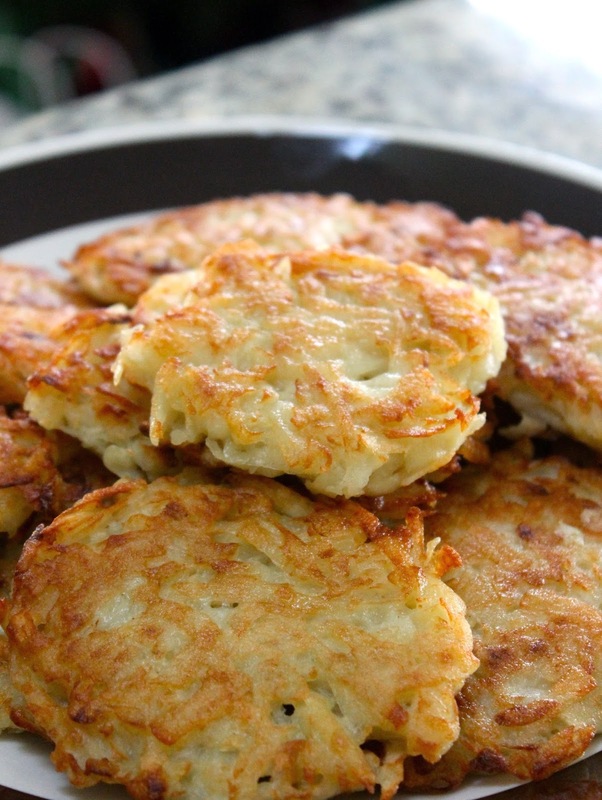 I don't know why, but I just love potato pancakes! Maybe it's all the carbs and oil!? Oh well! This recipe is from my former exchange students family, so it is a more traditional and basic recipe. Although there are variations to this recipe, I like to keep it simple and stick to my so-called German roots! The pancakes can be served as a snack or appetizer, but they are more traditionally served as a side during the holiday season. Peel and grate the potatoes and onion and place in a strainer since they will be very watery. Let them sit for about 10 minutes. You could also ring them out in a paper towel if you are in a rush. It is okay if they are still watery. I have skipped this step all together a couple of times when I was in a real rush. Transfer the potato and onion mixture to a bowl and mix in the salt and eggs. If using the flour, mix that in too. Set aside. Heat a skillet with oil (roughly 1/4 cup). Take a scoop of the mixture (I just use my hands) and form a little disk, roughly 2 - 3 inches in diameter, and flatten. Plop 3 - 4 of the pancakes at a time into the oil. Cook for a few minutes until golden brown and then flip to cook the other side. Each side will take roughly 3 minutes. Continue until all of the mixture is gone. You may need to add a little more oil in between batches. Remove the pancakes from the skillet and let dry on a paper towel lined baking sheet to help drain some of the oil. Serve warm with applesauce, or enjoy plain! Happy holidays! I make these myself but I will use this recipe. The applesauce seems good but my grandmother use to put sugar on them. 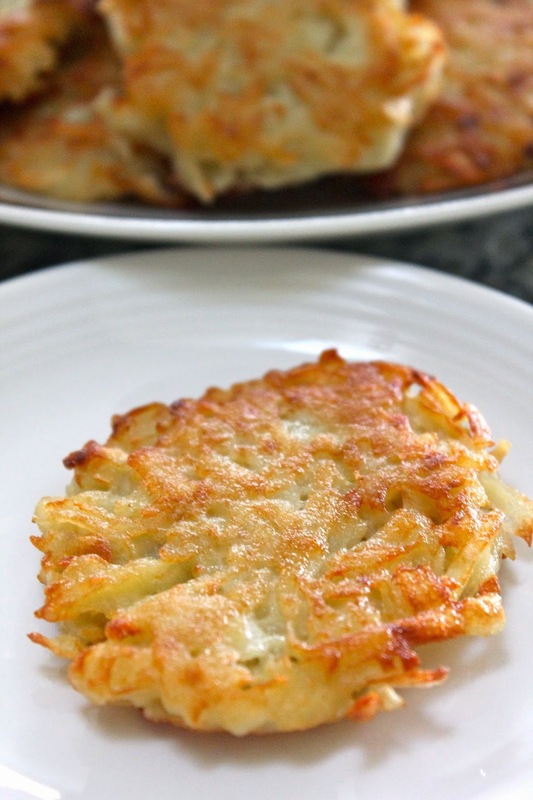 You probably could use HASH BROWN potatoes also if you don't feel like grating.